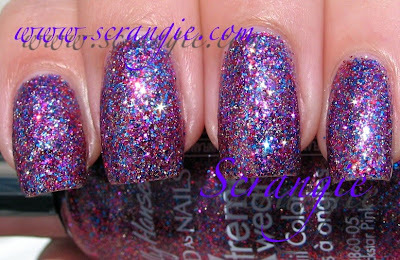 It's a really dense multi-color glitter (great coverage) that consists of light pink, purple, blue, red and a little silver. I don't like glitters that much but that's really pretty! I like the color a lot. Very nice. What kind of top coat do you use so the nail color wont chip all fast? very very cute and beautifull ! that is stunning! A new favorite! That reminds me a lot of OPI Mad As A Hatter. Either way, I like this one layered over the blue! The layering improved the standard polish. Muchly. AMAZING! Absolutely love this combo and how the glitter looks like it is floating over your nails. I can't wait to have this polish! great tip!!! I don't have Gelous....who makes that? I just bought that Sally Hansen and think the combination is so cool! nice job! I have Rockstar Pink. I haven't tried layering with it but your pictures are giving me the urge to! Love your combination more than the glitter just by itself. Good job! I love love love love rockstar pink. It's my favorite polish in my collection. I just bought Rockstar Pink yesterday. I'm on the lookout for a dupe for Ilamasqua Boo.... I like it over purple polish too! i got inspired by your post and layered opi sparkle-iscious over china glaze grape pop, which i already had on. it's an awesome combination <3 and such a nice, quick way to vamp up a mani if you don't have time to remove and all! I've held Rockstar in my hands quite a few times deciding if I should bother with it or not, and I imagined layering it over something blue like Royal Navy...so this was a great post to see! I just might have to grab it next time I'm at Walmart! :-) Thanks! I love glitter polish and I love what you did! How do you make the glitter polish so smooth on your nail? Your nails always look so smooth and shiny. Is Gelous the trick? I have Rockstar Pink. Love all that glorious glitter. Thanks for the tip about the topcoat. 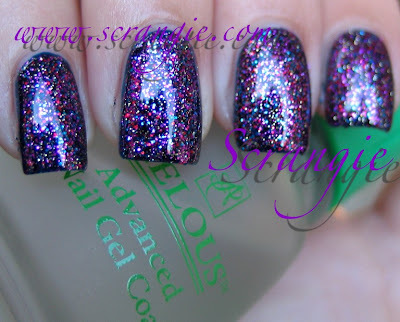 So if you layer you should totally layer Sally Hansen Nail Prisms Lavendar Pearl over any black. 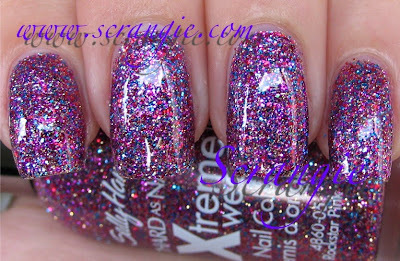 I'm so happy I scored this polish at the dollar store about a week ago because it is a near dupe of Orly's Space Cadet.